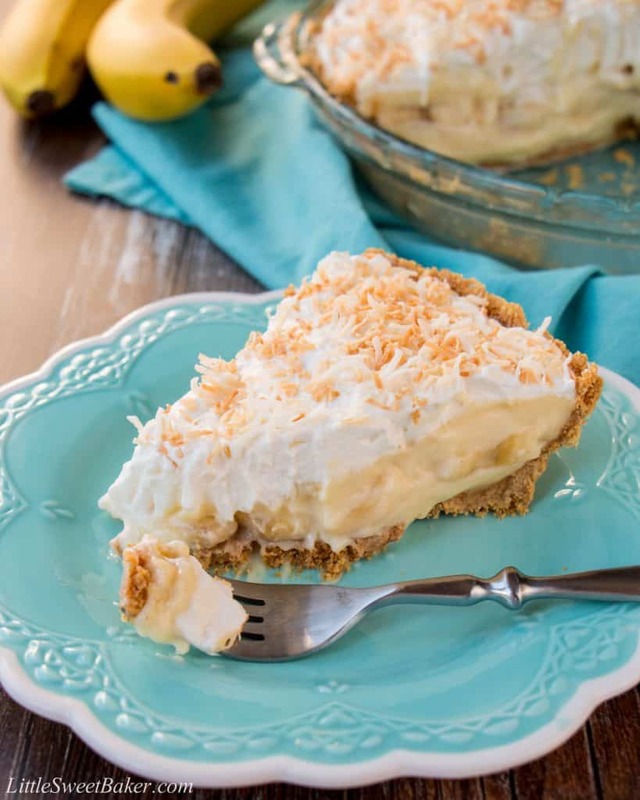 This amazing banana cream pie is made with a rich velvety-smooth homemade custard and it’s lined with a buttery honey graham cracker crust. 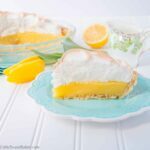 Filled with delicious sweet slices of bananas and topped with a fluffy whipped cream – it’s absolutely pie heaven! Before we had kids, my husband and I used to go out for a nice dinner every Friday night. I remember one of our favorite restaurants use to serve the most incredible banana cream pie. One time we had to leave dinner early because my husband had such a bad toothache. However before we could leave, I had to order a slice of banana cream pie to go. That’s how good it was, that my husband’s pain came second. The restaurant has since changed its menu. The banana cream dessert now comes in a jar and it’s just not the same. So again, I had to set out to make my own banana cream pie and let me tell you, it took a few tries. I first tried the shortcut method and used instant vanilla pudding instead of taking the time to make a homemade custard. Well that did not turn out well because the instant pudding wasn’t thick enough and I didn’t care for the taste either. My second attempt was with a recipe that had me fooled with the description and photo. Though I should have known better that you can’t make custard with 3 cups of 2% milk and just 2 whole eggs. Another soupy mess. For my third attempt, I went with this recipe from Chew Out Loud. Her custard recipe was more typical, using full-fat milk and a good amount of egg yolks. And since she is a fellow blogger, I trusted that her images were of the actual product. 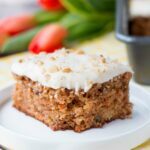 I made just a few modifications based on what I had on hand and I used my own honey graham cracker crust recipe because that’s how I remember the restaurant made it. 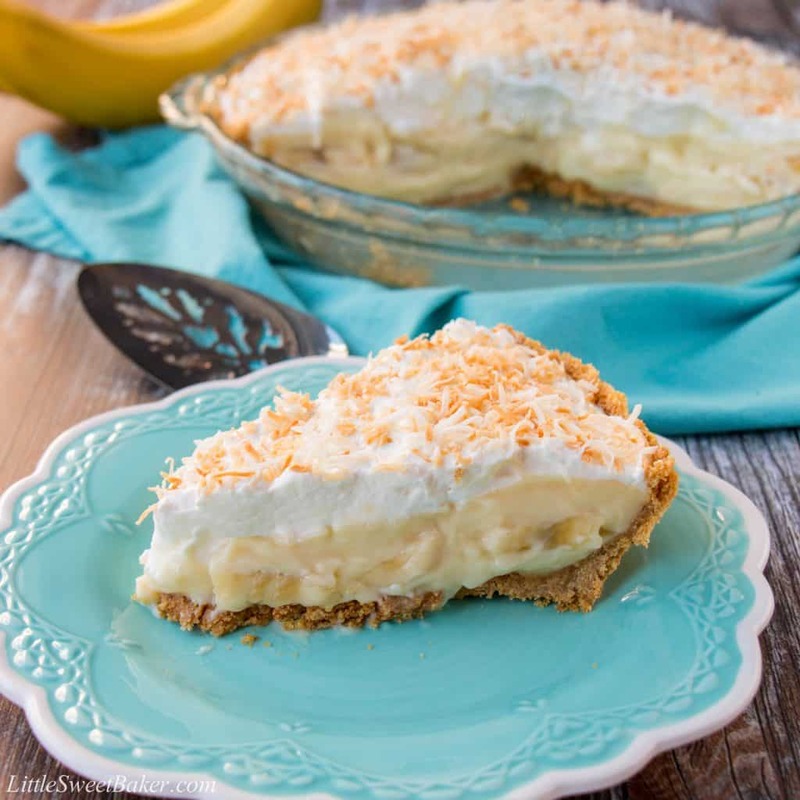 This banana cream pie is rich and creamy with the most delicious homemade vanilla custard. 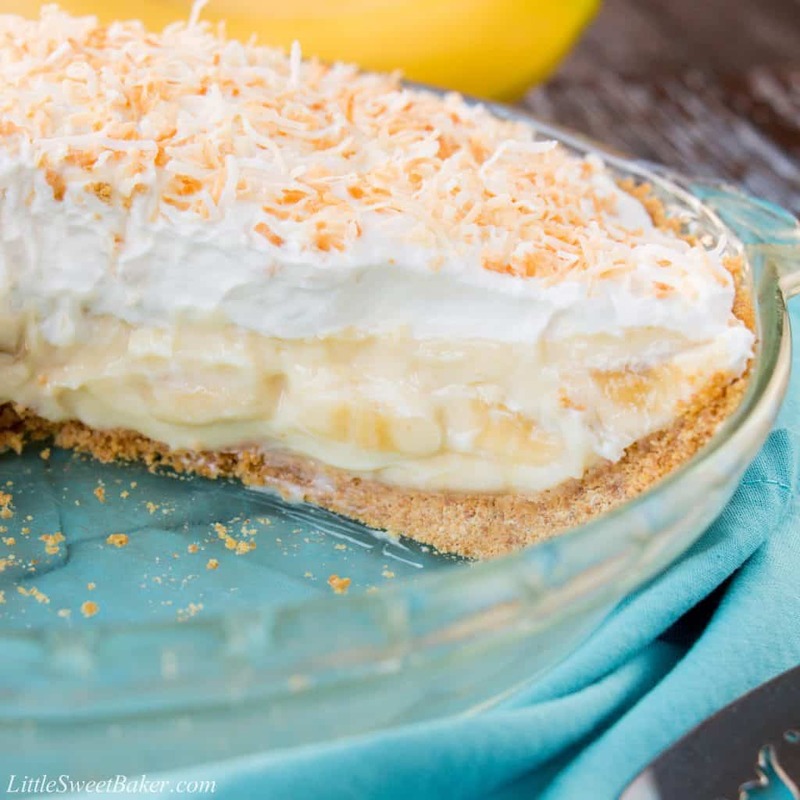 It’s filled with soft sweet slices of bananas and has a tender buttery graham cracker crust. 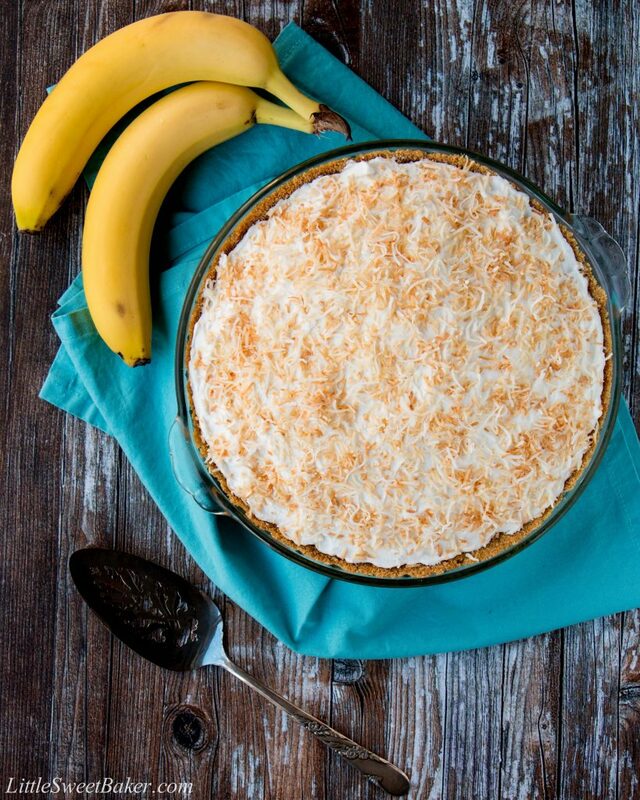 Topping with a light whipped cream and toasted coconut makes it the best banana cream pie. 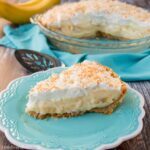 This amazing banana cream pie is made with a rich velvety-smooth homemade custard and it’s lined with a buttery honey graham cracker crust. 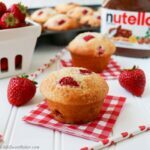 It’s filled with delicious sweet slices of bananas and topped with fluffy whipped cream. In a small bowl, mix together the honey graham cracker crumbs and melted butter until all is moistened. Press the mixture onto the bottom and sides of a 9″ pie plate. Set aside in the fridge. In a medium saucepan, whisk together the sugar, cornstarch, and salt. Whisk in the cream, egg yolks, and milk until smooth. On the stovetop over medium-high heat, bring to a simmer, whisking constantly until the mixture thickens and becomes smooth (5-10 minutes). Remove from heat, whisk in the vanilla extract. Let mixture cool to warm, stirring often with wooden spoon, 5 minutes. *Do not stir again after this. Place a single layer of banana slices onto the bottom of the crust. Pour half of the warm custard on top. Repeat with another layer of bananas and remaining custard. Chill in the fridge uncovered for a minimum of 6 hours to overnight. Beat the whipping cream, sugar and vanilla until medium peaks. Spread on top of pie before serving. Top with toasted coconut if desired.